An 'ISO image file' is a general-purpose file format that can be used to copy software or data to CD-ROM or DVD-ROM optical media. In cloud computing an 'ISO file' is used as a virtual equivalent to a physical CD or DVD. You will commonly find operating systems (such as different distributions of Linux) or other large software packages available in ISO format. This document describes how to upload and register an ISO image file for use in your VDC. An ISO that contains a 'bootable' image of an operating system can be used directly to deploy a VM. See How to create a VM by booting from an ISO. Any ISO can be attached to a VM to allow its contents to be read (equivalent to using a physical DVD drive). 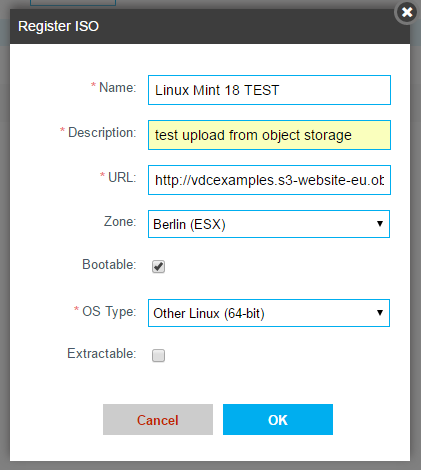 See How to attach an ISO to a VM. The maximum ISO size that you can use in VDC is 50 GBytes. You must ensure that your use of any ISO is compliant with the licensing requirements and the terms and conditions of the owners of any operating system or applications software that is contained in the ISO. Particular rules apply to the use of Microsoft products in a cloud environment; for more information see VDC Windows licensing. Please contact the Interoute licensing team, licensing@interoute.com, if you have any questions. 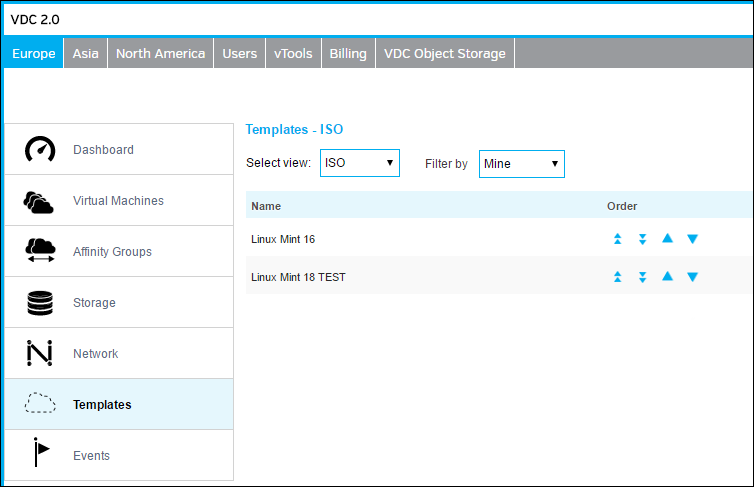 To see and manage the ISOs in your VDC, login to the Control Centre and click Templates on the left-hand menu. Make sure the Select view drop-down is set to ISO. The VDC Control Centre organises ISOs into different categories, which are viewed separately using the Filter by drop-down. All of the ISOs uploaded or created by you will be located in the Mine category. For ISOs that are owned by you, it is possible to delete them. Note that deletion is immediate and there is no recovery backup. You can upload an ISO from any Internet static URL. A URL containing '?' or any active code (for example, 'php' or 'js') will not work. To begin uploading, click Templates on the left-hand menu and set the Select view drop-down to ISO. Click the Register ISO button. The first stage of the upload should complete within a few seconds (that is, an ISO format file is found at the given URL), and the new ISO name will be added to the list. ISOs can be large files (typically 1 GB or more) and will take several minutes to upload. Click the name of the new template to display its status information. Check for the attribute 'Ready' being 'Yes' and 'Status' being 'Successfully installed'. It is possible that the upload may fail if an ISO cannot be found at the given URL, or if the ISO is not readable; any errors will be indicated in the 'Status' attribute. Your uploaded ISO can be used in the same way as any of the pre-loaded ISOs. For detailed instructions on creating a VM, see How to create a VM by booting from an ISO.